John LAVERY (1856-1941): High Treason 1916. Oil on canvas, 214 x 322 cms . The canvas is huge: ten feet by seven feet and it hangs at the foot of the great marble staircase within the King’s Inns,Dublin where it dominates the descent of the Benchers as they process on their way to dine. It is almost as if belongs there. The scene, in Courtroom I of the West Green Building of London’s Royal Courts of justice (now Courtroom 34) as viewed from the jury box, presents a unique social and legal record of immense historical importance. Here is a Dublin barrister in English Court pleading for the life of a British diplomat turned Irish revolutionary: the traitor in the dock. This is a real history-painting, caught by the artist’s own hand as he sits in the jury box, paints beside him, sketching, drawing, and listening to this dramatic moment in the long struggle between England’s laws and Ireland’s destiny. The date is 17July 1916 and it is Roger Casement’s Appeal against conviction for High Treason and sentence of death. In the same courtroom, just nineteen days earlier, the sentence itself had been handed down by the Lord Chief Justice, Viscount Reading, and two of his judicial colleagues. By the time of the Appeal, Casement had, by Royal command, been stripped of his knighthood and his honours so that he appears now as a plain Irish felon, a rebel, as the five scarlet-robed judges of the Court of Criminal Appeal listen to the pleadings for his life. Casement (Fig 8 in the Key) had been brought from the beach at Banna Strand, county Kerry to a cell in the Tower of London. There, under truly awful conditions, he was allowed to see the solicitor, George Gavan- Duffy (Fig 10 in the Key) – then a successful partner in a prestigious London firm – he became the first member of his legal team. But Gavan Duffy was warned by his partners that if he took on the case he must leave the English solicitor’s partnership and so, when – without hesitation – he accepted Casement as his client, he was effectively sacked. The case was to prove a turning point in Gavan Duffy’s life. Although English-born and English-educated – at the Catholic public school of Stonyhurst – he was of an Irish family rich in nationalist politics: his father, Sir Charles Gavan Duffy, was a prolific Irish historian, a founder member and editor of The Nation newspaper, and a leader of the Tenant League. He had been tried, with Daniel O’Connell, for sedition; and, for his role in the 1848 rising at Ballingarry, county Tipperary. Four times he was tried and acquitted. Eventually, he left Ireland for Australia where he rose to become Governor General of Victoria while his other son, Frank, rose to become Chief Justice of the High Court of Australia. After the Casement trial, George Gavan Duffy went on to a distinguished political and legal career. He was appointed by De Valera to the Treaty negotiations along with Collins, Griffith, Barton, and Duggan and was subsequently Ireland’s first Minister for Foreign Affairs. Later, he returned to the law, reading for the Bar at King’s Inns, and rising to become President of the Irish High Court. Gavan Duffy had been chosen for the trial by Casement’s devoted cousin, Gertrude Bannister, while Casement was imprisoned in the Tower and still uncertain as to whether he was to be tried by Court Martial and shot or whether he was to be tried by the Criminal Courts. 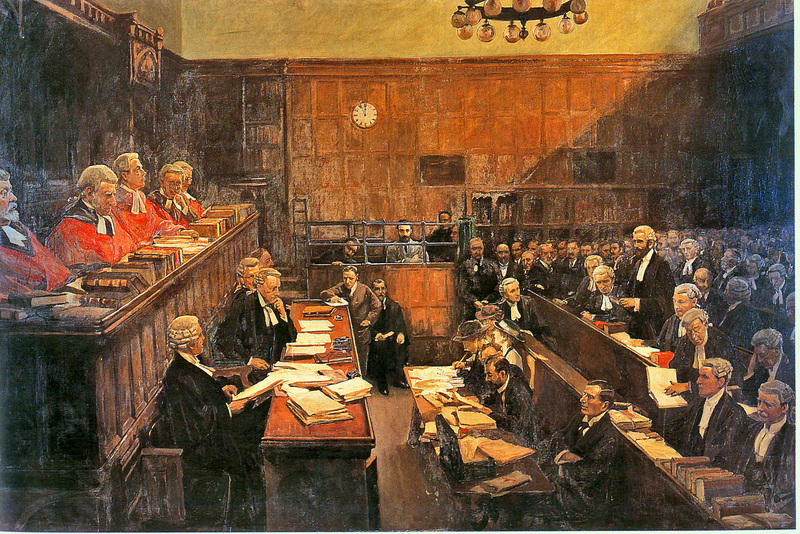 Gertrude, who attended each day of the Trial and each day of the Appeal, has not been identified in the painting but, as it is well known that during both hearings she was handed a series of notes from Casement, it is probable that she is the lady in the hat at the very end of the solicitors’ bench, directly beneath the dock in which Casements sits. Gertrude was a primary school teacher and as a price for helping her cousin, the traitor, she was sacked from her school with one week’s notice. Gavan Duffy initially turned to the English Bar to find a King’s Counsel for Casement but those whom he approached declined or refused the brief. It was not a propitious moment to represent a traitor who, as a guest of the German enemy, had sought to recruit an Irish Brigade from among captured prisoners of war drawn from the Irish regiments of the British Army; to do so would have been considered an act of treachery that could prejudice a future legal career, as Gavan Duffy already knew. As Junior Counsel, Gavan Duffy secured the services of a Welshman, Artemus Jones, who appeared at the Bow Street Magistrate’s Court hearing, at the Trial, and at the Appeal. (Fig 19 in the Key). Jones, who has recorded that Casement told him in the Tower of London that he ‘should be glad to die a thousand times for the name of Ireland’, was accompanied by an expert on constitutional law, Professor John H Morgan (Fig 20 in the Key) he was an old friend of Casements and an active and radical liberal party member. 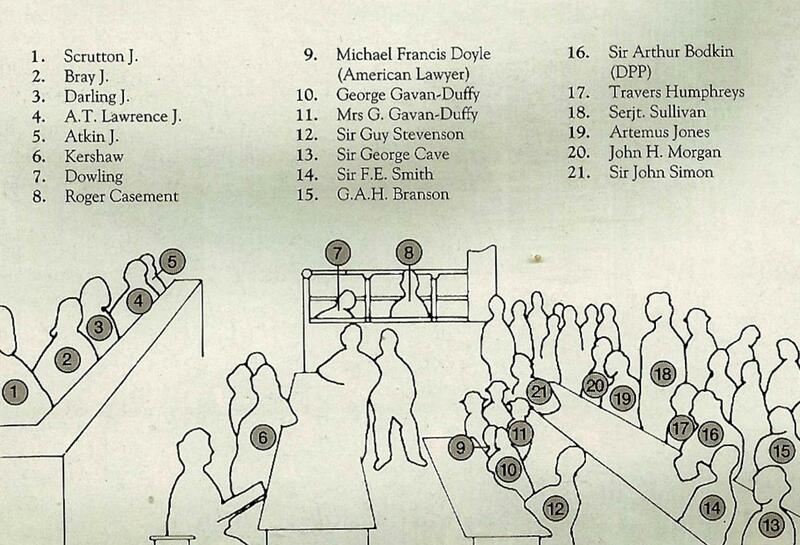 In his search for a King’s Counsel, Gavan Duffy eventually turned to the Irish Bar and to one of its leading advocates, Serjeant Sullivan, KC (Fig 18 in the Key) whose sister, Margaret (Fig 11 in the Key), was actually Gavan Duffy’s wife and who assisted him throughout the trial.. The office of Serjeant meant that the holder was a member of a superior order of barristers from whose ranks the Common Law judges were chosen. Their only distinguishing mark was a small patch of black silk set into the top of the wig. They were Crown law officers and could not, in the normal course of events, take a brief against the Crown. Sullivan sought the advice and sanction of Chief Baron Palles, the most distinguished of the Irish Judges, before taking up the Casement brief and it was Palles who encouraged him to accept it. In accepting, Sullivan wrote to Gavan Duffy saying, ‘…I would reluctantly go into the business providing I was handsomely paid…’ and he demanded a fee of 150 guineas. In the event, he was paid £530 for the Trial, which lasted four days, and a further fee for the Appeal. This was a handsome sum indeed for 1916 when a pound sterling could purchase up to forty pints of Guinness and the average weekly wage for a manual worker was less than a pound. The money was raised by Gavan Duffy and Gertrude Bannister through private donations from, amongst others, Sir Arthur Conan Doyle and William Cadbury, the Quaker chocolate manufacturer. Large sums were also raised in America by John Devoy of Clan na Gael in New York and brought over to England by an American Lawyer, Francis Doyle (Fig 9 in the Key), who was granted permission to assist the defence team. Montgomery Hyde, in his important book of the trial, records that this money was reimbursed to John Devoy by the German Secret Service. The Trial had to be adjourned and Junior Counsel completed the closing speech. But Sullivan, as we can see from the painting, had fully recovered by the time of the Appeal. Unionism was well represented both on the Bench – Viscount Reading, the Lord Chief Justice (not shown in the picture), was a well known Unionist supporter – and in the prosecution in F E Smith, the English Attorney General (Fig 14 in the Key), who was staunchly Unionist. He was a brilliant lawyer and exceptionally close to Edward Carson to whose Unionist cause he was deeply committed. He was known for a series of seditious and violent speeches and on one occasion had called on the young men of England to rise up against the Commons should they ever pass Home Rule bill into law. Yet, here he is: Attorney General, later to be Lord Chancellor of England, and known to history as Lord Birkenhead. F E’s Juniors for the prosecution were the Junior Treasury Counsel, Mr. Travers Humphreys (Fig 17 in the Key) and Mr. Archibald Bodkin (Fig 16 in the Key). On the opposite side of the Court, the presiding Appeal Judge, Darling, and his colleague, Atkin (Figs 3 and 5 in the Key), are shown on the Bench. Darling was also a Unionist and a close friend of Carson. In fact, it was he who took Carson – whom he regarded as ‘most unlike other Irishmen we meet… (as) …he is incapable of speaking balderdash’ – into his Chambers when Carson moved from the Irish to the English Bar. In the event, Casement’s Appeal was dismissed with Darling not even bothering to call on F E Smith and his team to reply to Sullivan’s two days of legal submissions and although a further Appeal, on a point of law, to the House of Lords was proposed, F E Smith as Attorney General refused to allow it. Next came appeals for clemency but, although the British Cabinet considered such appeals on three occasions, Casement;s fate was sealed and he would walk to the scaffold at Pentonville Prison on 3 August 1916. While Lavery’s painting is a tribute to Casement, it was not painted as such. On the contrary, it was commissioned by Darling as a commemoration of himself and the role he played in what was to be the most important State Trial of the 20th century. Darling and Lavery were old friends and indeed Lavery had previously painted him in his full judicial robes, wearing the black cap which indicated that he was pronouncing a sentence of death. The portrait now hangs in the Inner Temple, London. It was considered by many in the legal profession to be in poor taste. Darling’s decision to commission Lavery to record the Casement Appeal also attracted criticism and, in time, the painting became a source of embarrassment to the British authorities. Although commissioned by Darling, the picture was left on Lavery’s hands and, in his will, he bequeathed it to the National Portrait Gallery in London with the Royal Courts of Justice and the National Gallery of Ireland as residuary legatees. When the National Portrait Gallery declined the bequest, the Lord Chancellor’s Department accepted it for the Royal Courts; but the Lord Chief Justice did not want it hung in the Royal Courts of Justice and there was some embarrassment as to whether it was proper to refuse a bequest that had already been accepted, some years earlier. So, in the end, Serjeant Sullivan, who is generally held not to have handled the trial particularly well, performed a great and lasting service to Ireland by helping to secure for the King’s Inns this unique historical document. Borneo – a clean war?